Kevin and Lenny Bahr moved to Florida with their parents in 1969. 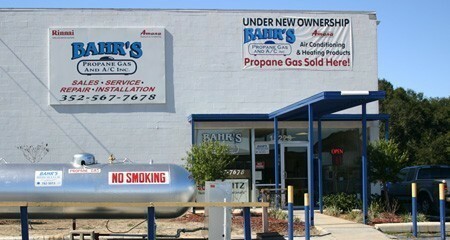 As they grew up in the Zephyrhills, Dade City Communities, the Bahr brothers decided to open up shop. Lenny Bahr made the decision to begin a venture down the propane gas route in 1982. Later in 1986, Kevin Bahr began his venture in air conditioning. Two years later, in 1988, the two brothers joined the propane gas and air conditioning companies to form Bahr’s Propane Gas & A/C, Inc. Since then, the business has grown to serve the community with three dispensing locations; two in Zephyrhills and one in Dade City, Florida. One of the dispensing locations in Zephyrhills, at 4441 Allen Road, and our location in Dade City, at 15229 US Hwy 301, are open year round. Our other Zephyrhills dispensing location, at 3708 Copeland Dr, is open in the winter months from November through March. All of our dispensing locations offer over 100,000 gallons of propane gas storage combined, and we are enlarging our storage capacity of our Dade City location. Year round, our company offers an annual maintenance check up for central heating and cooling units. The program consists of a thorough inspection and cleaning of the air conditioning unit. The maintenance program consists of oiling the motors; checking and recording the amperage of the motors and compressor, Freon, the thermostat, and ductwork and airflow; and cleaning the evaporator and condensor coils and drain and drain lines. Our maintenance program is beneficial to any client and those whose units are under warranty to keep from voiding that warranty. During a new air conditioning unit installation process, we come out to your home or location for a free estimate and assess what your needs are and determine the best available options for you. We conduct the estimate this way for that personal, hometown connection with our clients. Once you pick the air conditioning unit you like, we will order it, schedule an install date, and then install the new unit after we remove the old unit. Our service is available to you. Even when it’s after hours, we have a special answering service to take the call and distribute it to the corresponding "on–call" service technician. When the service technician gets the call, he will contact the customer to determine the problem and come to the rescue. This goes for both air conditioning and propane gas services. Propane gas service that we provide is quick and efficient; unless it’s the dead of winter, then we are extremely busy delivering gas and repairing heaters. Our propane delivery service consists of, but is not limited to, filling 100lb. tanks and up for residential and commercial users. During the propane gas installation process, we ask lots of questions. Our questions help us to determine your usage, and what size tank(s) would be appropriate for you and your needs. After installation of the propane tanks and corresponding appliances, we will explain how the propane gas system works and determine if you will become a "will call" customer or an automatic delivery customer. The difference between the two is that will call customers call us when they are in need of gas, hopefully before they run out. Automatic delivery customers have gas orders pulled automatically for us to fill their propane tank. We can repair most propane heaters and appliances. We strive to supply our clients with the most obtainable service in the area. Although we are a small family owned company, our licenses require us to be up to date with compliance. Therefore, we know our stuff! Bahr’s Propane Gas & A/C, Inc. has been in business for quite some time, and wants to provide that hometown feeling for our clients. When it comes to air conditioning, heating, propane gas, and more we are your Go–To Experts! “Thank you for your promptness. Your tech was a gem! Will be happy to let any friends know of your excellent service!” Robin R.